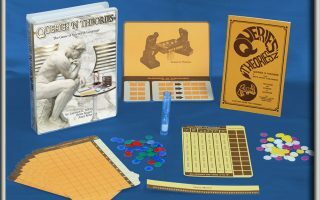 The ultimate scientific code breaking game, QUERIES ‘N THEORIES teaches players the intricacies of designing and decoding complex transformational languages by using the power of careful reasoning. The game starts when one player, the “native”, designs a secret coded language. Languages are defined by basic expressions – sequences of colored chips called “basic sentences”, and by transformational rules which allow certain sequences of chips to be replaced by others to create new expressions in the language. The job of the other players in the game, the “theorists”, is to try to decipher the pattern of the secret language by asking the native a series of “queries”. A query is a proposed sample expression. The native must confirm whether a proposed query expression can be created by the rules of the secret language or not. Careful analysis of the answers to these queries allows the theorists to design critical tests that will provide maximum information by eliminating competing possibilities for the rules of the secret language. The theorist who can correctly predict the behavior of the native’s language wins. 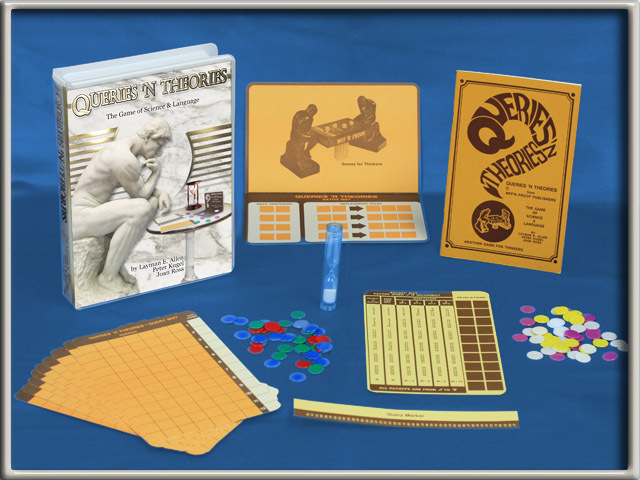 QUERIES ‘N THEORIES is a powerful simulation of the kind of scientific reasoning used to probe the laws of nature. It develops the crucial skill of recognizing the right question to ask based on organizing, analyzing and synthesizing the patterns of known facts. 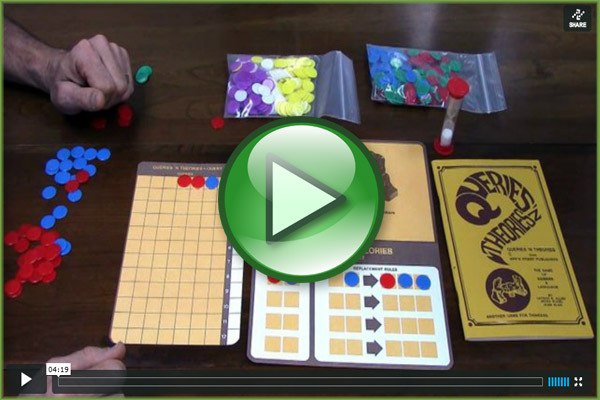 Beginning games that use only a few basic sentences and rules and can be enjoyed by children. The advanced games in this 13-level series are marathons of challenging intellectual twists and turns that will keep intelligent adults fascinated for hours.